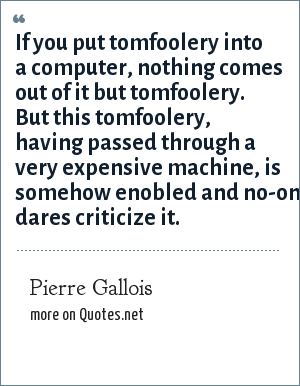 Pierre Gallois: If you put tomfoolery into a computer, nothing comes out of it but tomfoolery. But this tomfoolery, having passed through a very expensive machine, is somehow enobled and no-one dares criticize it. Pierre Marie Gallois was a French air force brigadier general and geopolitician. He was instrumental in the constitution of the French nuclear arsenal. This earned him the nickname of father of the French atom bomb. "Pierre Gallois Quotes." Quotes.net. STANDS4 LLC, 2019. Web. 23 Apr. 2019. <https://www.quotes.net/quote/20340>.